Former governor of Alaska Sarah Palin addresses a crowd of some 1600 people at the Hilton Garden Inn in Missoula during a fundraiser for Teen Challenge Sunday afternoon. Praising God and America, former Alaska Gov. Sarah Palin brought an adoring crowd to its feet with her message of faith, family and the power of prayer during a Sunday fundraising event to support a Christ-centered Missoula women's residential center. 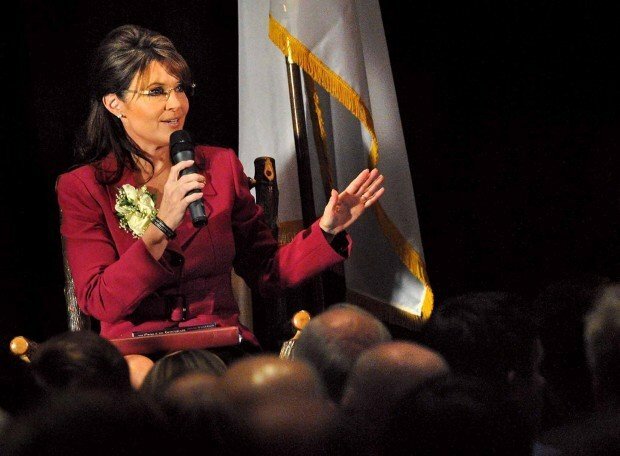 "God and family and country - take a stand in that order and things fall into place," Palin told a sold-out crowd of 1,600 at the Hilton Garden Inn during her 40-minute talk at the "Raise the Roof" capital campaign for Teen Challenge. 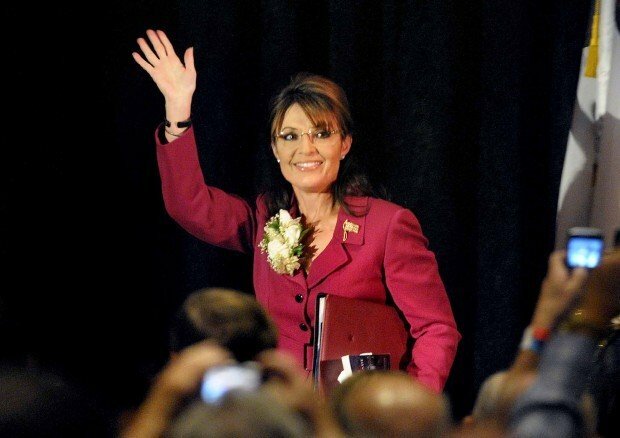 "Taking a stand for God is not always easy ... but it is always right and worthwhile," Palin said. God and prayer help people find their true calling and innate talents, she said, and in God's "cosmic calculus" for each of us he provides the lessons we must learn in our individual journeys. Teen Challenge, she said, is an example of God's work in action. Each day, the national program helps alcoholics become sober, drug addicts come clean and helps scared, unwed teen mothers turn that hardship into life's great blessing. There are no perfect families, Palin said - and family isn't just who you are born into, but who you choose to be around. In the inevitable troubled times, it is faith in God - and prayer - that see people through. She knows all about that, Palin said, in her relaxed and casual speaking style. At age 43, having been elected as Alaska's first female governor, Palin found herself pregnant and carrying a child who tested positive for Down syndrome. For seven months, Palin said she kept the revelation a secret to all but her husband, Todd. She just wasn't ready to talk about something she didn't quite have her head around. And, she explained, prompting empathetic laughter from the crowd: "I knew what the ol' sourdoughs were going to say. We finally have a woman for governor and she goes and gets pregnant." The experience has taught her untold lessons, chief among them: "God doesn't give you anything you can't handle." And after seeing the perfection in her youngest son with special needs: "God shows us what he wants us to see." During her talk, Palin at times deviated from her awe-filled words of faith to take swipes at the media - at one point proclaiming that "moles" were in the audience texting about her belief in prayer and taking it all out of context, as per usual. She also took swings at the nation's political leaders - who remained nameless - but who she believes are leading the United States in the wrong direction. "Why is it called the far right when it is just common sense?" she asked. And later, "The government that governs least governs best." Robust applause erupted when Palin laid out her no-holds-barred opinion about the way the country is currently being governed. "The things they are doing in Washington, D.C., are absolutely whacked," she said. "They are upside-down." Not wanting to get "too political," Palin shared, but touched lightly on her steadfast beliefs: that America would be well served if it "emulated" and "implemented" Montana's spirit of independence; that U.S. armed forces are forces of good in the world and a source of pride; that America needs more brave people to take a stand for it and not apologize for it. She worries most about the nation's trillion-dollar debt, and paraphrasing Thomas Paine, she advocated tackling the problem now so the next generation of Americans can live in peace without the problem. On a local level, she said, change only happens when individuals do the hard work, demand change and help with the transformation. "I love my country and I love our system, but government can't fix the problems - government is the problem," she said. "Government can't dry a tear or lend a shoulder or put back together a family, or country or state." Teen Challenge's success rate in doing just that - healing and helping - is far beyond scientific comprehension, she said. "Faith-based prescription is so effective, that's why government doesn't like it," Palin said. Describing it as "part church, part school and part hard work," the group doesn't rely on taxpayer money. "It's neighbor helping neighbor, the way America used to be," she said, "and we need to get back to that." Palin's call to action was certainly heard by her audience. When she finished her talk, Palin offered to match the price a Palin-signed T-shirt would bring for Teen Challenge's $450,000 fundraising campaign. The money will be used to add a commercial kitchen and dining room to the group's West Seventh Street home in Missoula. Sarah Palin protesters looked ready for a good show Sunday on Howard Raser Avenue. A speech by former Alaska Gov. Sarah Palin helped raise $130,000 for a Missoula shelter for young mothers with addictions to alcohol or drugs.